If I paid you big $$$ to stare at a wall... would you? Here's my story of refusing golden handcuffs and striving to "stay hungry and stay foolish." I was an engineer with a cushy job. I created software in an office park, in a chair that squeaked. Exhibit A: the squeak came from this lower region. We made them. Adjusted them. Moved them. Then we adjusted them some more. But were human beings put on this Earth to create widgets? The principal called me into his office. A lunch lady accused me of calling her a name, but she must have confused me with someone else. I had to apologize. "This Valentine's Day," I wrote in an email to friends, "pack your lunch. Don't buy it from the cafeteria. This is a lunch strike. Forward this to everyone you know." And a few days later, hundreds of students packed their lunch. I'm in the green jacket. We had 150 members, and our mission was to "playfully spread joie de vivre and enliven public space." One day, we tossed ideas around, and our minds began to speed up. Somebody said we should do a flashmob. Another person said, "make it absurd - worship something big!" Finally we all decided to organize a flash mob where people would temporarily 'worship' a fountain while chanting nonsense Gregorian-style. "A slew of people seemingly worshipping the fountain can be read as the requirement for all students to bow down before the great phallic, ejaculating symbol of a patriarchal university." Dr. Freud, sometimes a cigar is just a cigar. So why had I resigned to widgets? Every evening I read books. As many as possible. And I tracked my investment on large boards. Each black X represents 15 minutes of study. Red Xs are an hour. This OCD brought to you by Connect 4. Then I put these goals on another enormous board. A friend and I discussed them weekly. And finally, at the end of every quarter, we reflected on our progress and what we learned. Then I made 30 new goals. Rinse and repeat for 3 years. Zoom in real close like, and you'll discover my secrets. That was in the evenings. During the days I still sat in my squeaky chair making... widgets. What? Why are we wasting our potential on this? I looked at a coworker's screen. I decided not to stay much longer. So I put a picture of a surfer next to my computer, and I continued saving money. I studied and spoke a new language. And I surfed in the Mediterranean. It was sweet. I was walking around the Old City of Jerusalem. The sky was sunny and blue. Crisp air. The buildings and streets made of the same light brown stone. Thousands and thousands of fervently religious Muslims, Christians, and Jews. Each one lipping their own sacred scriptures. Each one consumed by their own ideology. And each one actively trying to shut out the modern world, a suffering hero in their own self-orchestrated purgatories. The more obsessive and exclusionary the more their peers called them pious. These might be the wackos who blow up the world! 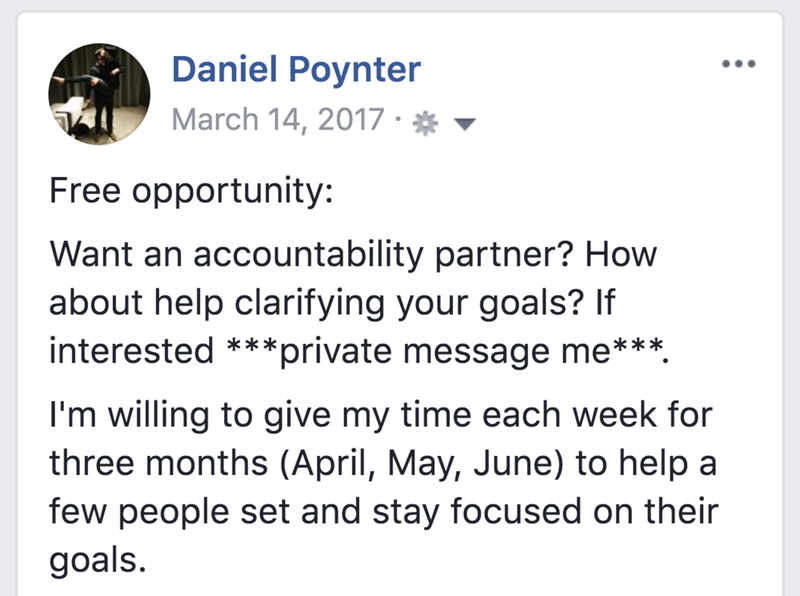 And it was around that time that a friend heard about my comprehensive and determined tracking of goals and reading. "You'd make a great coach," he said. I missed America and its expansive sense of possibility, exploration, and adventure. I missed its openness to try new things — rather than merely repeat historical scripts. And became a professional coach. I knew how I wanted to contribute to the world: Nurture the next generation of leaders (and learn from them). People who chart the middle path -- between religious fundamentalism on the one hand and complete relativism on the other. Pragmatic idealists. I threw myself in... full-time. But still, it wasn't easy! I found a coach that clicked! We're both high energy, and he's a few years ahead of me on the path. His perspective, guidance, accountability, encouragement — and leadership — gave my business enormous traction. I'm passionate to help YOU get traction. I know how challenging it is to feel like you have a gift to give — and a responsibility to share it. I know how challenging it can be to go off on your own. Are you an entrepreneur with BIG DREAMS -- like Elon Musk, Dean Kamen, or Paul Newman? Are you solving GLOBAL PROBLEMS -- like Buckminster Fuller, Stewart Brand, or Albert Schweitzer? And are you guided by your HEART -- like Martin Luther King Jr., Mahatma Gandhi, or Fred Rogers (yes that Mr. Rogers)? I'm passionate to help you help the world. Let's increase your income, independence, and impact. Learn from my coach's mistakes. And learn from his coach's mistakes.